The men and women who volunteer to protect our country put their lives at risk every day—even during peacetime and when close to home. On 21 March 1987, Captain Dean Paul Martin, Jr., United States Air Force, a fighter pilot assigned to the 196th Tactical Fighter Squadron, 163rd Tactical Fighter Group, California Air National Guard, paid the ultimate price when his McDonnell F-4C-25-MC Phantom II, serial number 64-0923, slammed into 11,501.6-foot (3,505.7 meter) San Gorgonio Mountain. The airplane hit at the 5,500-foot level (1,676 meters), inverted, at 560 miles per hour (901 kilometers per hour). Also killed was Captain Ramon Ortiz, U.S.Air Force, the Weapons System Officer. Captain Martin was piloting the #2 aircraft, Grizzly 72, in a flight of three. They took off from March Air Force Base in Riverside County, California, in trail, and made a maximum performance climb through multiple layers of cloud and falling snow. Much of the time it was not possible to maintain visual contact, and formation was maintained with radar. The flight leader, Grizzly 71, requested to climb to a higher altitude to get clear of the clouds but Air Traffic Control was not able to authorize that because of a large volume of civilian traffic above them. Martin was unable to maintain formation, and knowing that mountains were near, requested a left turn. The controller authorized the turn, but had to repeat himself several times due to frequency congestion. The pilot of the #3 aircraft, Grizzly 73, briefly caught sight of Martin’s Phantom through a break in the clouds. He saw Grizzly 72 begin a sharp left roll and its afterburners ignite before it disappeared into the clouds again. It is probable that Captain Martin lost spatial orientation because of the steep climb under acceleration while passing in and out of cloud layers. There may have been another factor, though: Martin was divorced from his second wife, Olympic Gold Medalist Dorothy Hamill, but had hopes of a reconciliation. While obtaining a briefing in the weather office just prior to this flight, a worker there asked Martin what he thought about Hamill’s re-marriage two weeks earlier. Martin had been unaware of this and was visibly shaken by the news. This may have been an additional distraction at just the wrong time. At any rate, Dean Paul Martin joined the Air Force to make something of himself and to make a meaningful contribution. He wanted to be more than “Dean Martin’s son” or an entertainer. 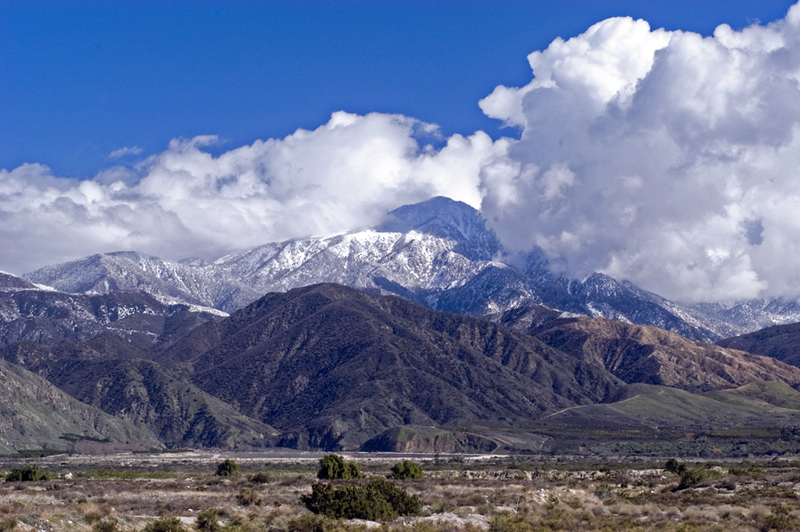 The crash on San Gorgonio Mountain is a sad end to a noble venture. Peace is Our Profession. But it is always a perilous occupation. Rest in Peace, Gentlemen. 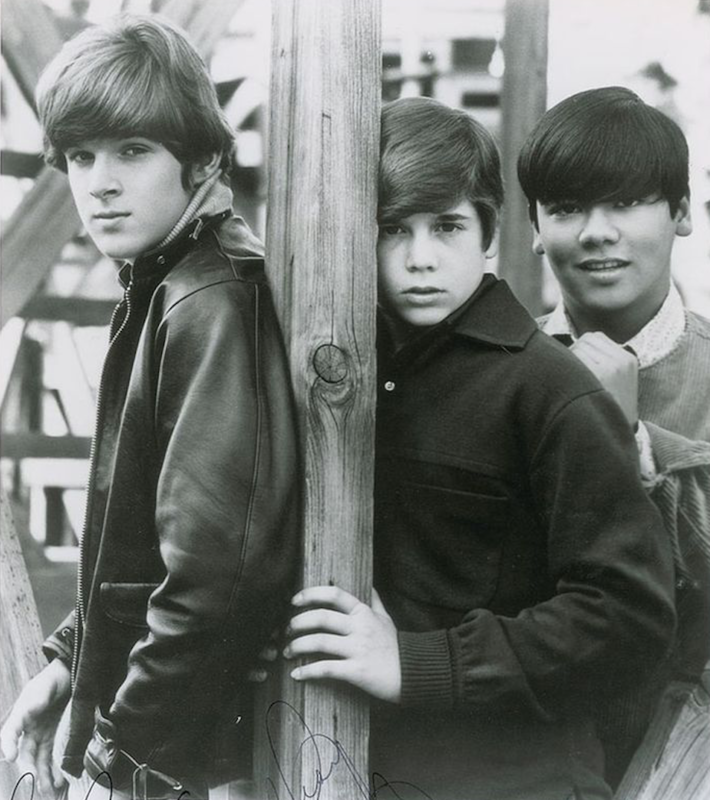 Dean Paul Martin, Jr., was born 17 November 1951 in Santa Monica, California. He was the first of three children of entertainer Dean Martin and Dorothy Jean Biegger Martin. He was educated at the Urban Military Academy in Brentwood, California, and was a pre-med student at the University of California, Los Angeles (UCLA). While there, he played football and tennis. Martin later completed his degree at the University of Southern California (USC). “Dino” Martin earned a private pilot license at the age of 16 years. He was a professional tennis player, and, later, was a wide receiver for the World Football League Las Vegas Casinos, in Las Vegas, Nevada. Mr. and Mrs. Dean Paul Martin, Jr., (née Olivia Osuna Hussey), 17 April 1971. 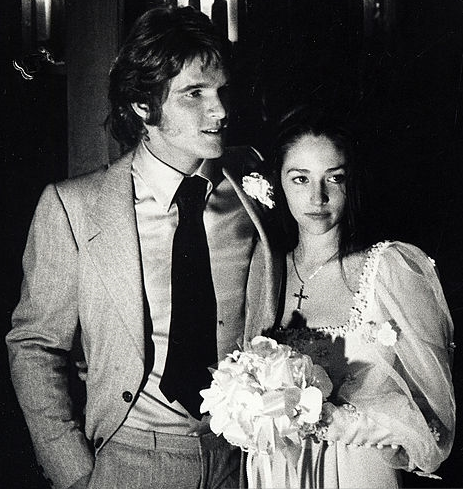 On 17 April 1971, Martin married Miss Olivia Hussey in Las Vegas, Nevada. (Miss Hussey is best known for her portrayal of Juliet Capulet in Franco Zeffirelli’s “Romeo and Juliet,” 1968). They had a son, Alexander. The couple were divorced 24 January 1979 in Los Angeles, California. Also in 1979, Martin starred with actress Ali McGraw in Paramount Pictures’ “The Players.” Martin’s character was a professional tennis player. 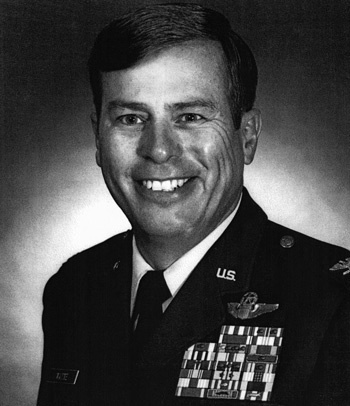 Dean Paul Martin, Jr., joined the United States Air Force 5 November 1980, and underwent pilot training in the Cessna T-37 Tweet and Northrop T-38A Talon at Columbus Air Force Base, near Columbus, Mississippi. 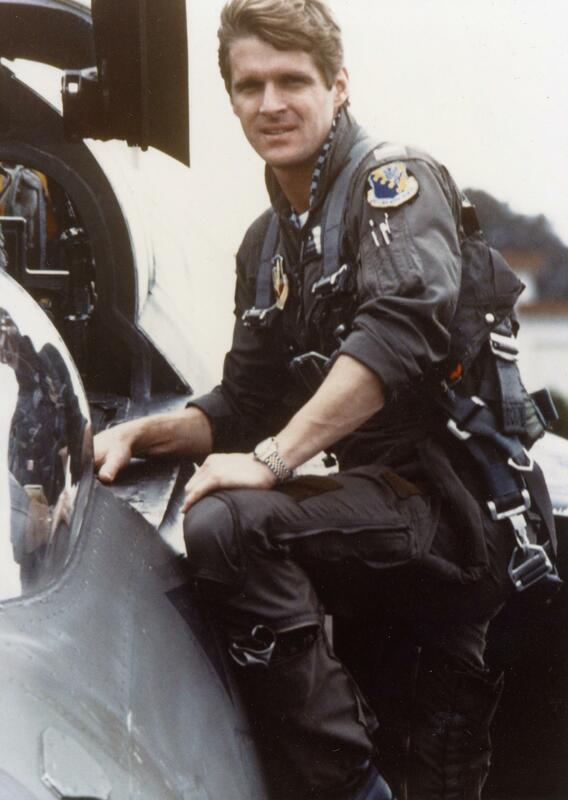 He trained as fighter pilot in the McDonnell F-4 Phantom II at Luke Air Force Base, west of Phoenix, Arizona, completing the course in November 1981. He was assigned to the 193d Tactical Fighter Wing, California Air National Guard, based at March Air Force Base, Riverside County, California. He initially served as a Weapons System Officer in the McDonnell F-4C Phantom II, before upgrading to aircraft commander. 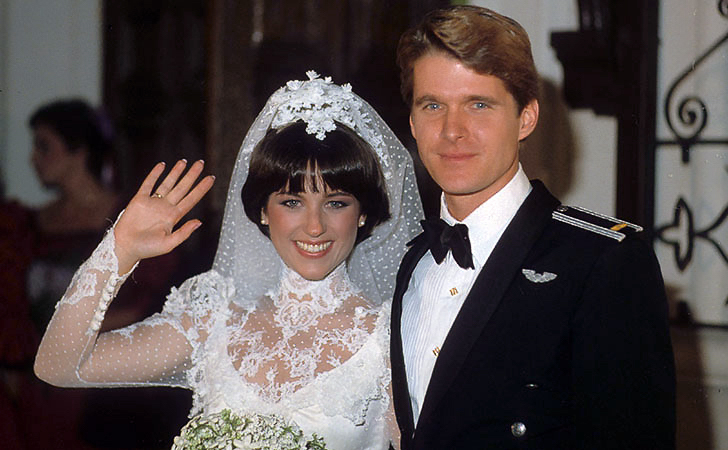 Lieutenant and Mrs. Dean Paul Martin, Jr., (née Dorothy Stuart Hamill), 8 January 1982. Martin married Olympic Gold Medalist Miss Dorothy Stuart Hamill, 8 January 1982, in Beverly Hills, California. They divorced in 1984. Captain Martin’s remains were buried at the Los Angeles National Cemetery. Ramon Ortiz was born 31 August 1947, in Ponce, Puerto Rico, an island in the Caribbean Sea and an unincorporated territory of the United States. Ortiz joined the United States Air Force 22 December 1973 and served on active duty until 13 November 1980. Captain Ortiz’ remains were buried at Palm Memorial Park, Las Vegas, Nevada. 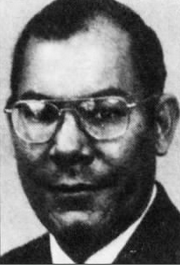 Major John R. Pardo distinguished himself by gallantry in connection with military operations against an opposing armed force over North Vietnam on 10 March 1967. On that date, Major Pardo was flying as the pilot of the lead element on the return from a 1,000 mile flight in which heavy flak damage was encountered. He noticed that his wingman’s aircraft was in trouble and was advised that the aircraft was extremely low on fuel. 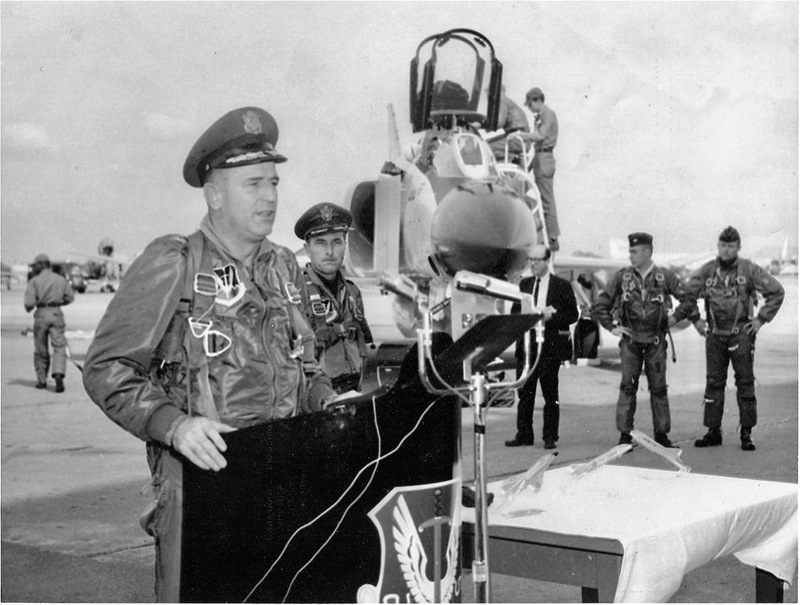 Realizing that the wingman’s aircraft would not make it out of North Vietnam, Major Pardo implemented maneuvers to literally push the aircraft across the border. The attempt was successful and consequently allowed the crew to avoid becoming prisoners of war. By his gallantry and devotion to duty, Major Pardo has reflected great credit upon himself and the United States Air Force. 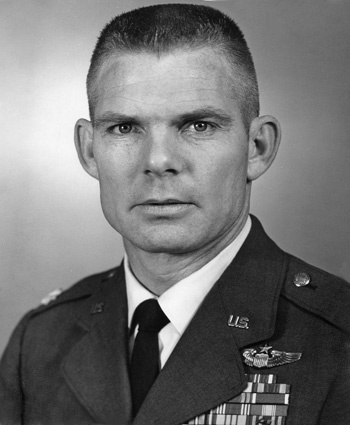 First Lieutenant Stephen A. Wayne distinguished himself by gallantry in connection with military operations against an opposing armed force over North Vietnam on 10 March 1967. On that date, Lieutenant Wayne was flying as the copilot of the lead element on the return from a 1,000 mile flight in which heavy flak damage was encountered. He noticed that the wingman’s aircraft was in trouble and was advised that the aircraft was extremely low on fuel. 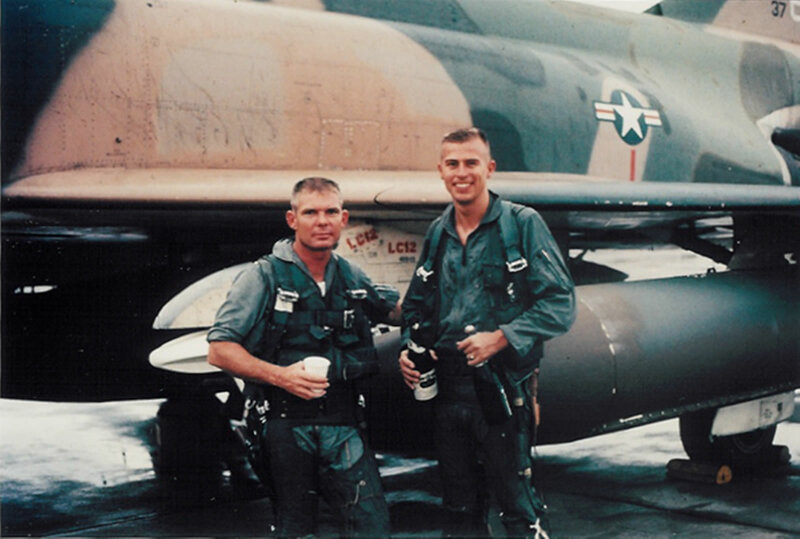 Realizing that the wingman’s aircraft would not make it out of North Vietnam, Lieutenant Wayne assisted in implementing maneuvers to literally push the aircraft across the border. The attempt was successful and consequently allowed the crew to avoid becoming prisoners of war. By his gallantry and devotion to duty, Lieutenant Wayne has reflected great credit upon himself and the United States Air Force. “Pardo’s Push,” by S.W. Ferguson. 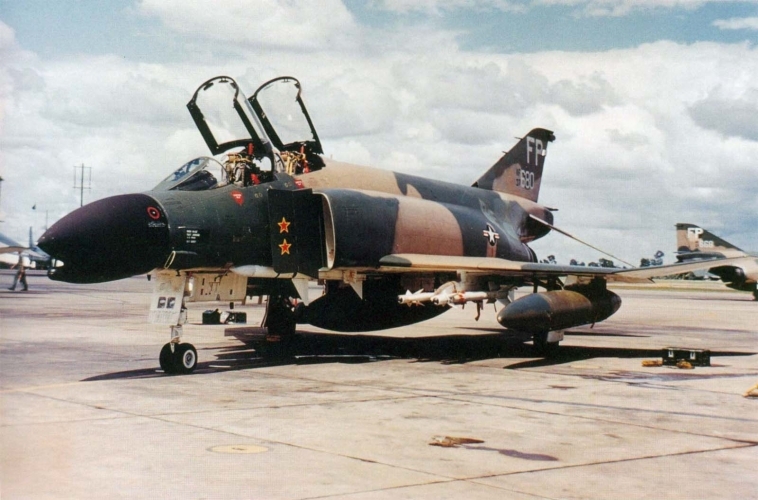 With both aircraft damaged during an attack on Thai Nguyen Steel Plant and unable to reach their base, one F-4 Phantom II pushed the other so that all four airman could bail out over the Laos where they could be rescued, rather than risk capture in North Vietnam. This is one of the most famous events in aviation history. 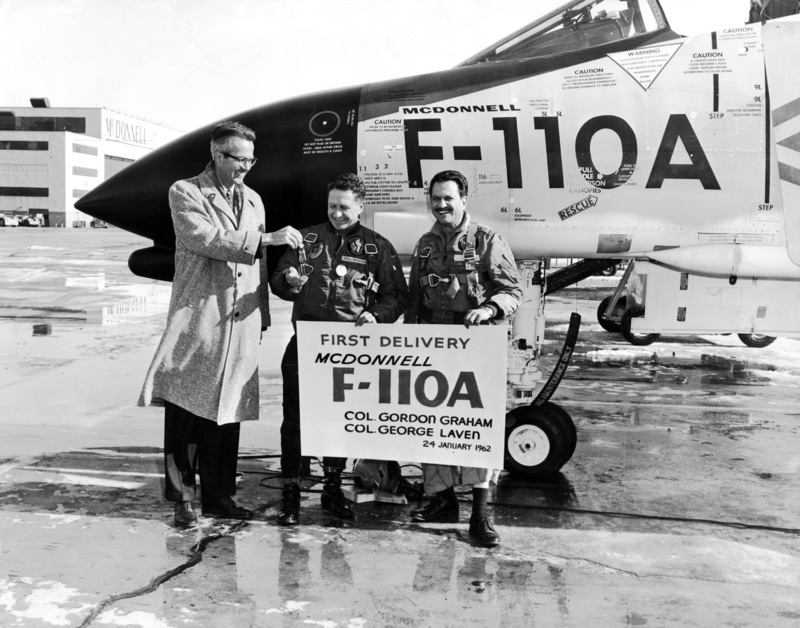 24 January 1962: The McDonnell Aircraft Corporation delivered the first F-110A Spectre to Colonel Gordon Graham and Colonel George Laven, United States Air Force, at the McDonnell plant at St. Louis, Missouri. The F-110A was soon redesignated as the F-4C Phantom II. Two Phantoms were delivered to the Air Force for evaluation at Langley Field, Virginia. They were U.S. Navy F4H-1 Phantom IIs, Bureau of Aeronautics serial numbers 149405 and 149406. Initially the aircraft retained the Navy serial numbers but eventually were assigned Air Force numbers 62-12168 and 62-12169. 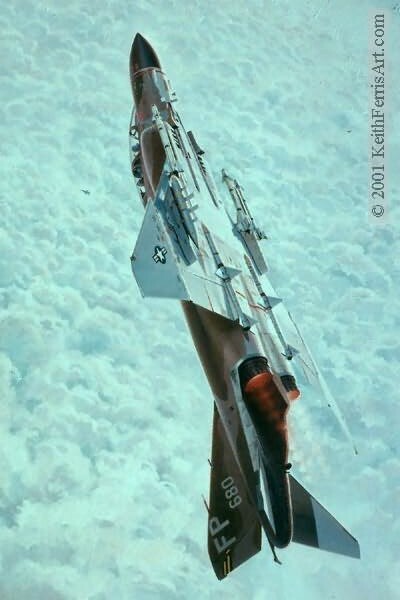 The Air Force bailed them back to McDonnell to develop the YF-4C prototypes. 62-12169 (ex-Bu. No. 149406) was converted to a JF-4B (a special test aircraft). Operated by the McDonnell-Douglas Aircraft Center at Holloman Air Force Base, New Mexico, it suffered an engine explosion, 8 March 1967. 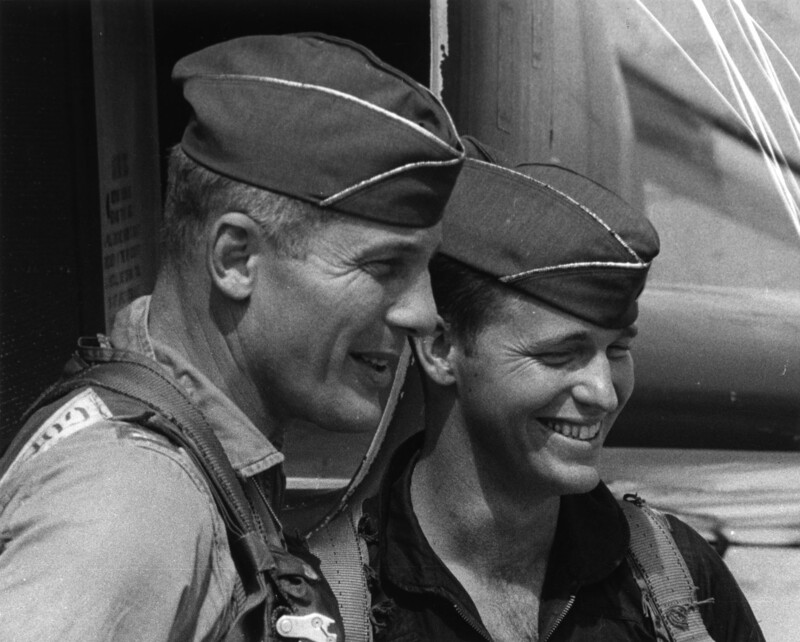 McDonnell test pilot Charles (“Pete”) Garrison successfully ejected. The airplane crashed and was destroyed. McDonnell built 5,057 Phantom IIs. They served with the United States Navy and Marine Corps, the U.S. Air Force, and many allied nations. 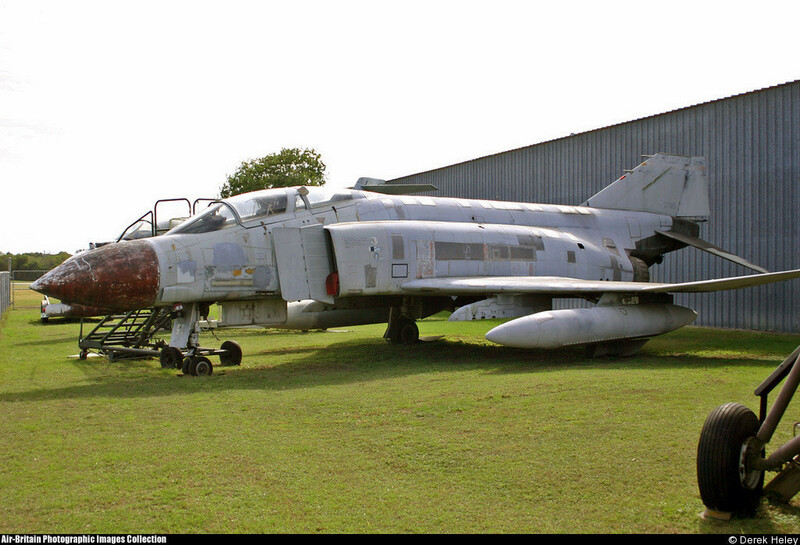 The last Phantom II, an F-4E, was completed 25 October 1979. The U.S. Air Force retired its last operational Phantoms from service 20 December 2004, 42 years, 10 months, 27 days after receiving the first F-110A. 2 January 1967: This painting, MiG Sweep, by aviation artist Keith Ferris, depicts “Olds 01” during OPERATION BOLO. 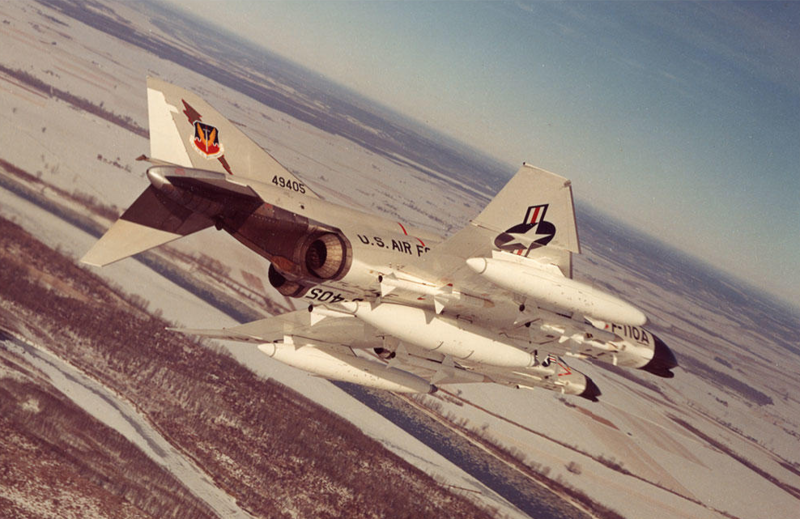 The twin-engine all-weather jet fighter, a McDonnell F-4C -21-MC Phantom II, serial number 63-7680, was flown by Colonel Robin Olds, USAF, with First Lieutenant Charles C. Clifton, USAF, as the Weapons System Operator. 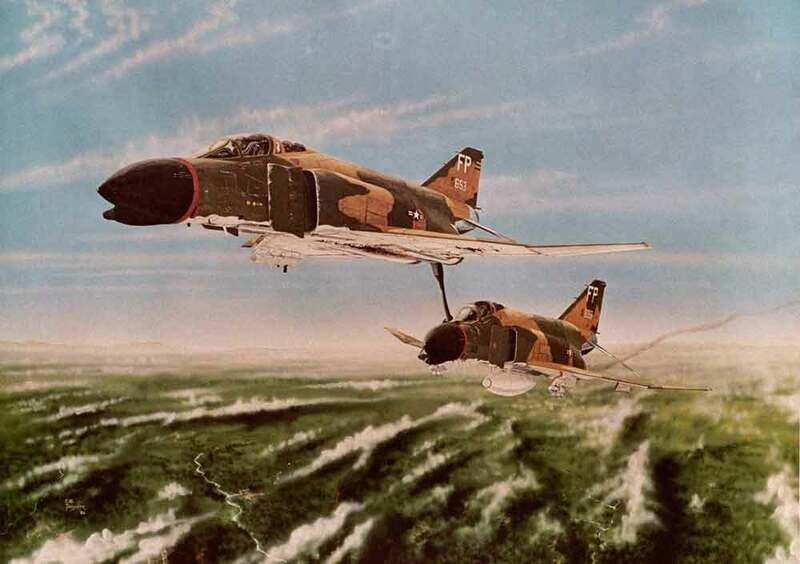 In this painting by Keith Ferris, the Phantom is shown inverted as Colonel Olds maneuvers to fire an AIM-9B Sidewinder heat-seeking missile at a North Vietnamese Mikoyan-Gurevich MiG-21 over Hanoi. 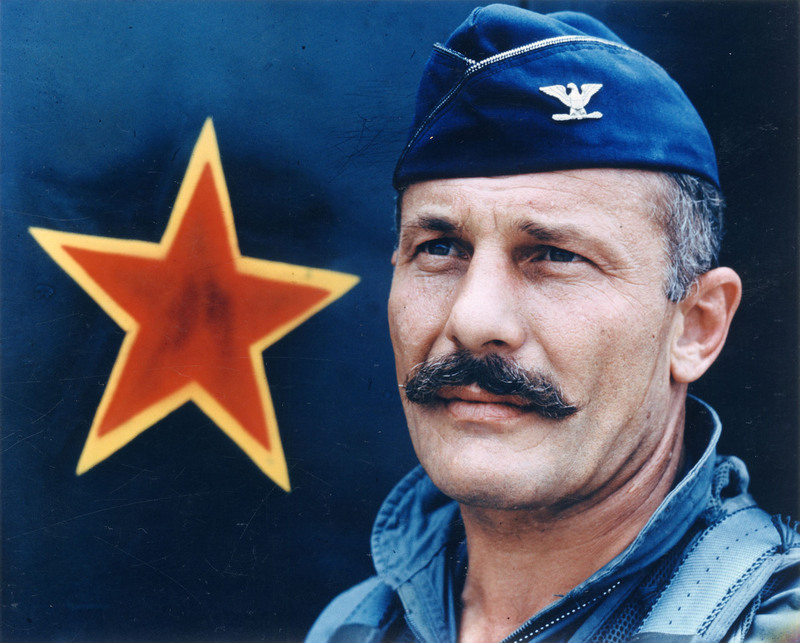 Robin Olds was the only U.S. Air Force ace with victories in both World War II and Vietnam. The area around Hanoi, North Vietnam, was the most heavily defended target area ever encountered by the United States Air Force. A combination of radar-directed anti-aircraft artillery, surface-to-air guided missiles, and fighter interceptors made every mission very dangerous. Republic F-105 Thunderchief fighter bombers were taking heavy losses to the Soviet-built Mikoyan-Gurevich MiG-21PFL fighters. 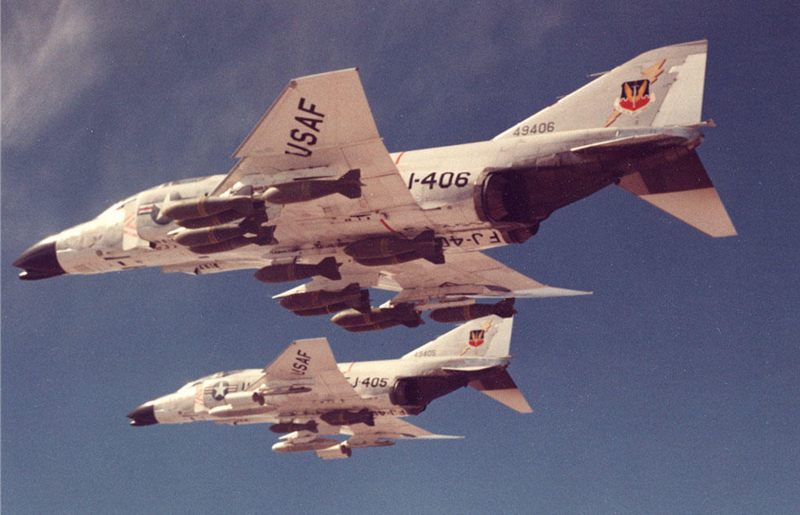 When escorting F-4C Phantoms would try to engage the MiGs, they would return to their bases which were safe from attack under the American rules of engagement. As the Mach 2+ MiG 21s started coming up through the clouds, their pilots quickly realized that instead of the vulnerable targets of F-105s on a bomb run, they were faced with air superiority fighters. “At the onset of this battle, the MiGs popped up out of the clouds. Unfortunately, the first one to pop through came up at my 6 o’clock position. I think this was more by chance than by design. As it turned out, within the next few moments, many others popped out of the clouds in varying positions around the clock. “This one was just lucky. He was called out by the second flight that had entered the area, they were looking down on my flight and saw the MiG-21 appear. I broke left, turning just hard enough to throw off his deflection, waiting for my three and four men to slice in on him. At the same time I saw another MiG pop out of the clouds in a wide turn about my 11 o’clock position, a mile and a half away. I went after him and ignored the one behind me. I fired missiles at him just as he disappeared into the clouds. —Aces and Aerial Victories: The United States Air Force in Southeast Asia 1965–1973, by R. Frank Futrell, William H. Greenhalgh, Carl Grubb, Gerard E. Hasselwander, Robert F. Jakob and Charles A. Ravenstein, Office of Air Force History, Headquarters USAF, 1976, Chapter II at Page 39. The F-4Cs succeeded in shooting down seven Mig-21s, with another two probably destroyed. 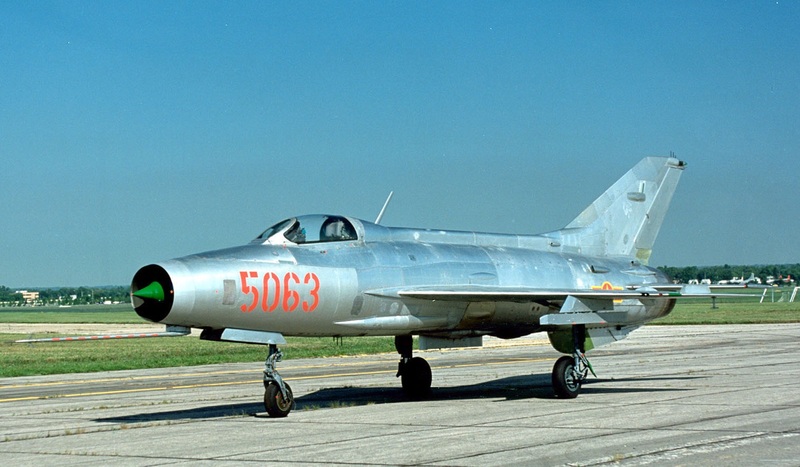 This accounted for about half of the VPAF’s MiG-21 complement. 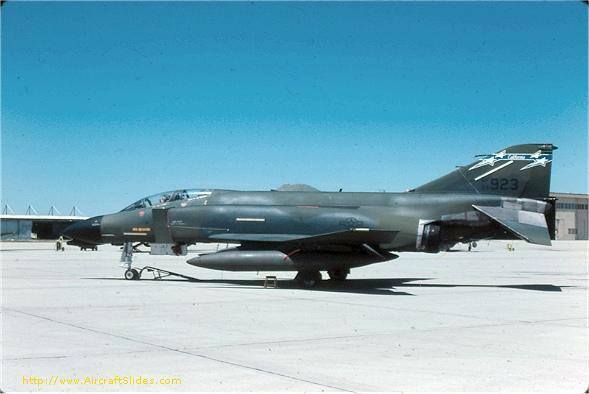 With another flight crew the Phantom flown by Robin Olds on 2 January 1967, McDonnell F-4C-21-MC 63-7680, shot down a MiG 17 on 13 May 1967. It was itself shot down by antiaircraft fire while attacking a SAM site, 20 November 1967. The Weapons System Officer, 1st Lieutenant James L. Badley, bailed out and was rescued, but the pilot, Captain John M. Martin, was not seen to leave the aircraft and is listed as Missing in Action. 20 November 1963: The U.S. Air Force Tactical Air Command accepted its first two production McDonnell F-4C Phantom II jet fighters, F-4C-15-MC 63-7415 ¹ and F-4C-15-MC 63-7416. These aircraft were the ninth and tenth production F-4Cs. They were flown to MacDill Air Force Base, Tampa, Florida, by Brigadier General Gilbert Louis Meyers, commanding the 836th Air Division, and Colonel Frank Kendall (“Pete”) Everest, a world-famous test pilot, commanding the 4453rd Combat Crew Training Squadron. 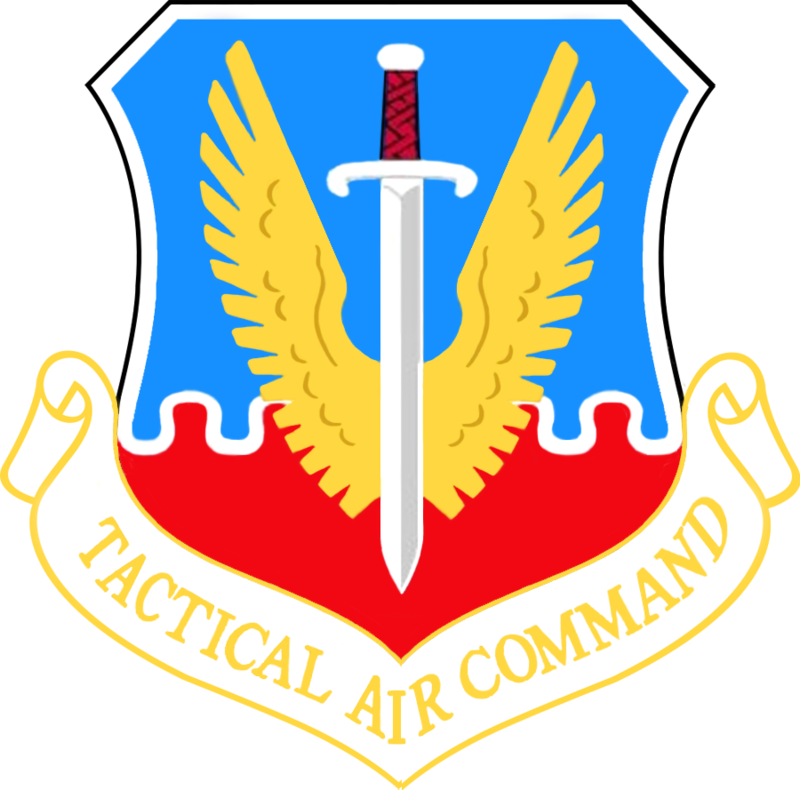 Lieutenant General Charles B. Westover, Vice Commander, Tactical Air Command, formally accepted the new fighters on behalf of TAC. Up until this time, the 4453rd had been training crews with McDonnell F-4B Phantom IIs on loan from the United States Navy. The McDonnell F-4C Phantom II (originally designated F-110A Spectre) was produced for the U.S. Air Force, based on the U.S. Navy McDonnell F4H-1 (F-4B after 1962) fleet defense interceptor. 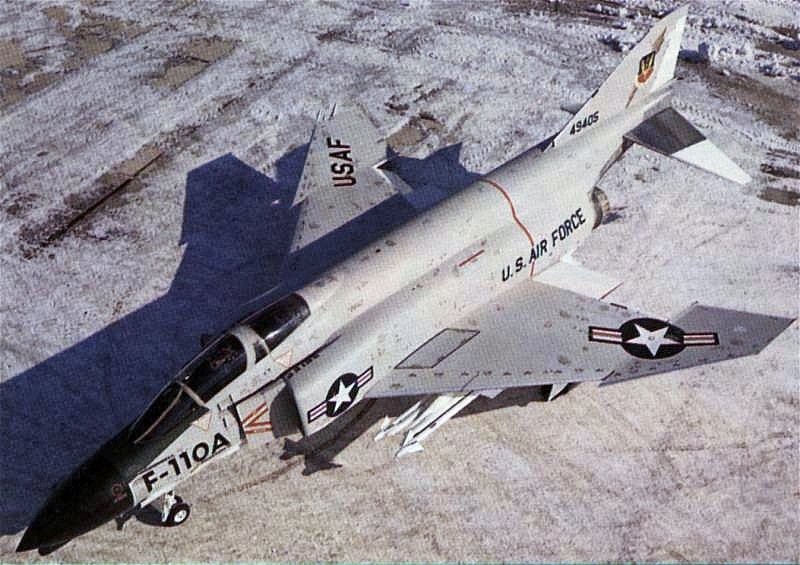 Evaluation testing had shown the the Navy’s F4H was superior to the Air Force Convair F-106 Delta Dart. It was faster, could fly higher, had a longer range and greater payload. It was also better suited as a tactical fighter. The Navy operated its Phantom IIs with a pilot and a radar systems operator. The Air Force’s F-4C variant was equipped with dual flight controls and was flown by two rated pilots. 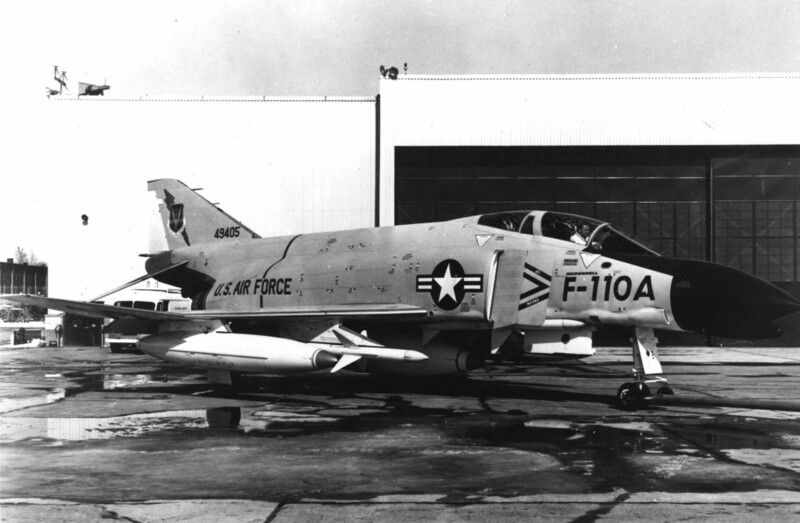 The F-4C was externally the same as the F-4B, but otherwise differed by the addition of a ground attack capability. Also, while the F-4B used a hose-and-drogue system for air-to-air refueling, the F-4C was equipped with a boom refueling system. It retained the folding wings and arresting hook of the Navy variant, but deleted catapult provisions. 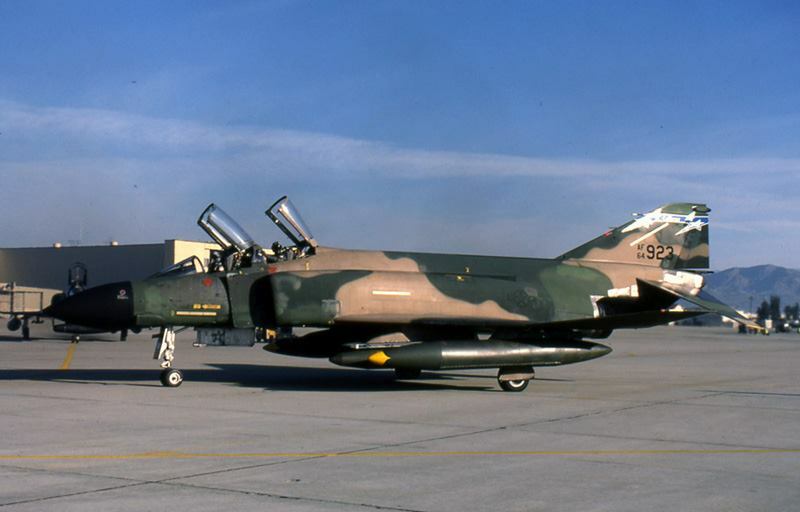 McDonnell F-4C-15-MC 63-7415 in four-color South East Asia camouflage scheme, in service with the Hawaii Air National Guard. 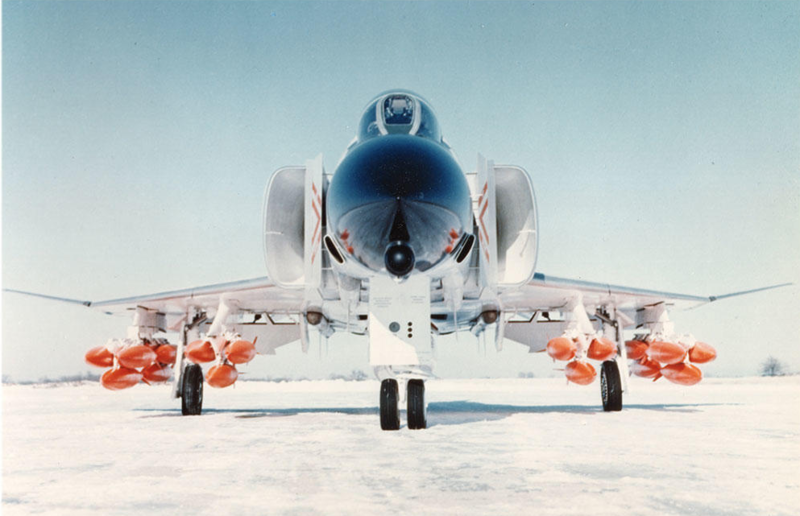 The F-4C was 58 feet, 3¾ inches (17.774 meters) long, with a wingspan of 38 feet, 5 inches (11.709 meters) and height of 16 feet, 3 inches (4.953 meters). Its empty weight was 28,496 pounds (12,926 kilograms) and its maximum takeoff weight was 58,000 pounds (26,308 kilograms). The F-4C-15-MC was powered by two General Electric J79-GE-15 engines. The J79 is a single-spool, axial-flow turbojet engine, with a 17-stage compressor section and 3-stage turbine. 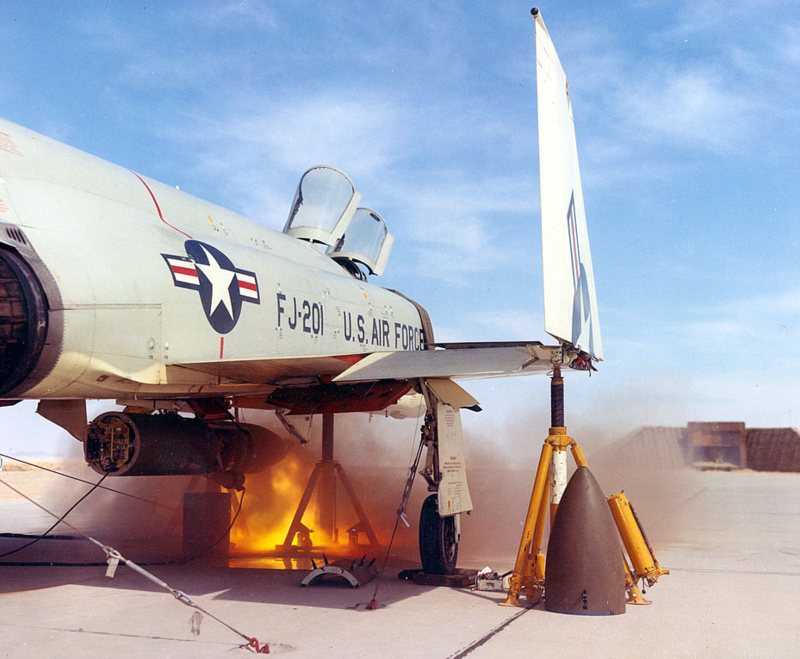 The J79-GE-15 is rated at 10,900 pounds of thrust (48.49 kilonewtons) and 17,000 pounds (75.62 kilonewtons) with afterburner. It is 17 feet, 4.7 inches (5.301 meters) long, 3 feet, 2.3 inches (0.973 meters) in diameter and weighs 3,699 pounds (1,677.8 kilograms). McDonnell F-4C-15-MC 63-7415 in three-color gray air superiority camouflage, 199th Tactical Fighter Squadron, Hawaii Air National Guard. The F-4C had a maximum speed of 826 miles per hour (1,329 kilometers per hour)—Mach 1.09—at Sea Level, and 1,433 miles per hour (2,306 kilometers per hour)—Mach 2.17— at 48,000 feet (14,630 meters). The fighter’s service ceiling was 56,100 feet (17,099 meters). Its maximum unrefueled range, with external fuel tanks, was 1,926 miles (3,100 kilometers). The standard armament for the F-4C were four AIM-7 Sparrow radar-homing missiles carried in recessed in the bottom of the fuselage. Four AIM-9 Sidewinder heat-seeking missiles could be carried on underwing pylons. A maximum of 16,000 pounds (7,257 kilograms) of bombs on five hardpoints. 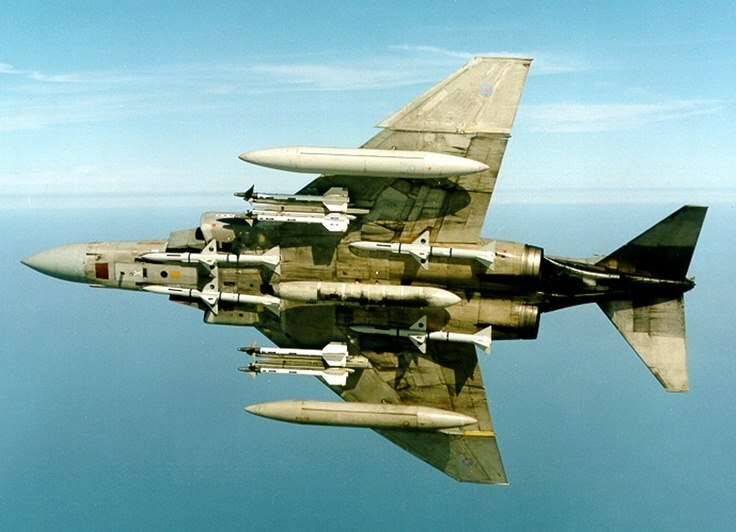 During the Vietnam War, the missile armament of the Phantom II was found unsatisfactory in dogfights with enemy aircraft. The violent maneuvers of Air Combat Maneuvering (“ACM”) made it difficult for the missiles to align and track the intended target. Of 612 AIM-7 Sparrows fired by F-4s, only 56 enemy aircraft were destroyed, while 187 AIM-9 Sidewinders brought down 29 enemy aircraft. This was a kill ratio of 9% and 16%, respectively. 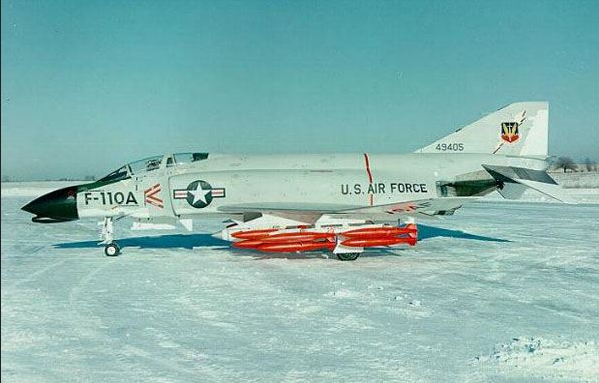 Forward-thinking planners had assumed that an all-missile armament was all that was required in the modern era, so F-4s were built without any machine guns or cannon. The Air Force used an SUU-16/A pod containing a General Electric M61A1 20 mm rotary cannon with 1,200 rounds of ammunition mounted to the F-4’s centerline hardpoint. (Two additional SUU-16/A pods could be mounted on the outboard underwing hardpoints.) This was useful in close-in combat, but the airplane was not equipped with a suitable gun sight. 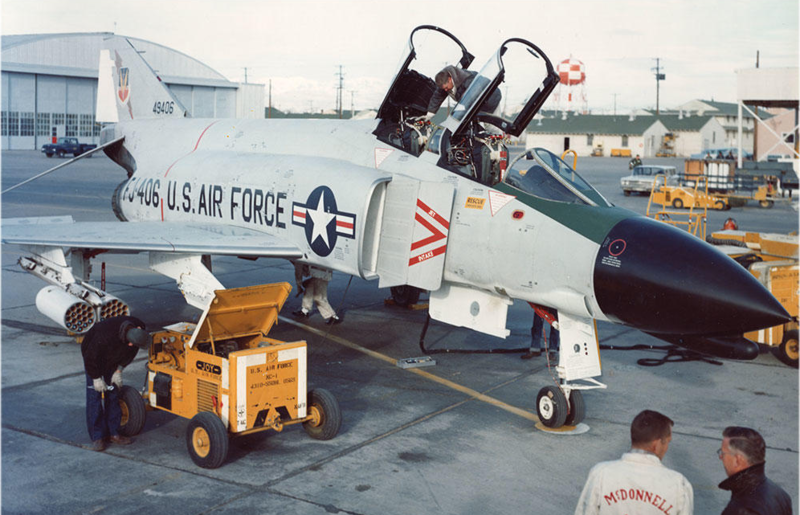 It was not until the F-4E variant that a gun was incorporated into the airplane. 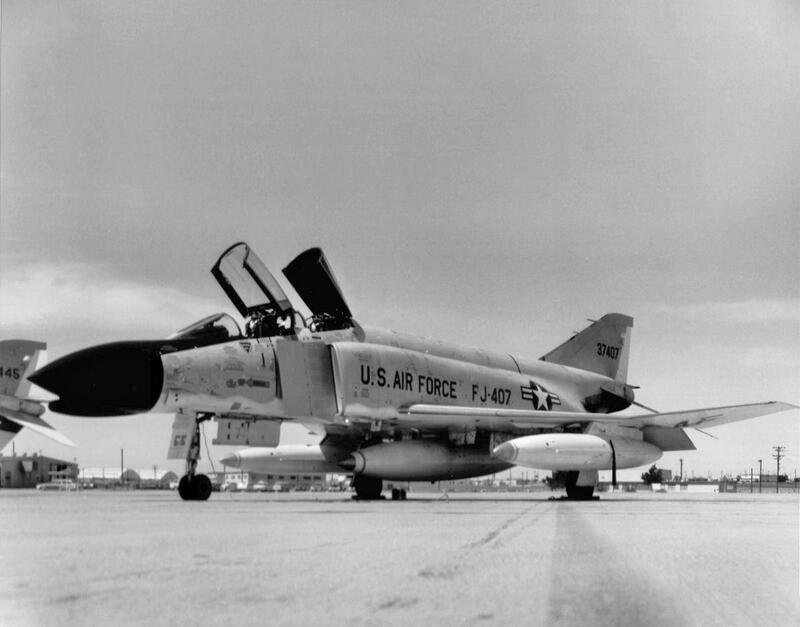 The F-4C first flew 27 May 1963. 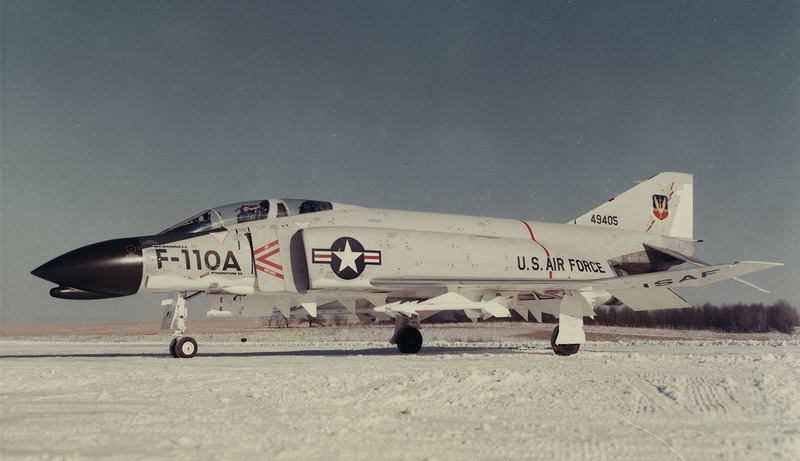 583 of this variant before production shifted to the F-4D in 1966. 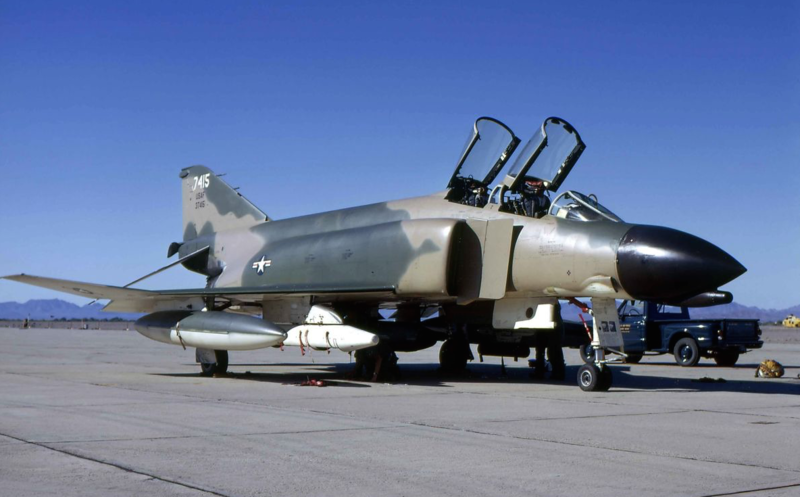 The F-4C remained in service until the last was retired from the Oregon Air National Guard in 1989.